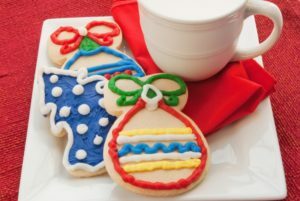 The holiday season brings with it parties, family gatherings, fun, and food! However, this can be a challenging time for your teeth since you may eat and drink things you normally wouldn’t. Believe it or not, many people experience dental emergencies during the holidays due to Grandma’s famous peanut brittle, or find themselves with cavities in the New Year due to the extra sugar intake. Your dentist in Columbia offers some helpful tips on keeping your teeth healthy during the holidays. Our normal schedules are sometimes thrown off during the holidays due to travel, or late night parties. Don’t let this keep you from brushing your teeth at least twice per day and flossing at least once. Sticking to your regular home care routine will help protect your teeth against the plaque buildup that causes tooth decay and cavities. If you experience dental pain, or a chipped or broken tooth, don’t wait to contact your dentist. Dealing with a potential emergency situation in a timely manner may save you time, pain, and money in the long run. If you are out of town contact a local dentist to be seen as soon as possible for an emergency examination. The holidays offer us plenty of opportunities to enjoy foods we don’t normally get to eat throughout the year. Try to avoid additional snacking between meals in order to protect your teeth, and allow you to fully enjoy your holiday meals. It’s easy to snack on things you normally wouldn’t eat during holiday parties. You might find yourself chatting at the snack or dessert table and just mindlessly grabbing whatever is in front of you. Be mindful about what you eat during parties, and reach for fruits or veggies. Also be wary of sugary drinks like eggnog or champagne. Drinking water during a party will keep you hydrated while also protecting your teeth. If you have questions about your oral health, or need to visit the dentist during the holidays your team at Columbia Healthy Smiles can help! Dr. Philip A. Batson is carrying on the tradition of high quality dentistry that his father started over 40 years ago. Patients in Columbia, MO enjoy the friendly and caring service they receive when they come to Columbia Healthy Smiles for their dental care. If you would like to learn more about Columbia Healthy Smiles, Dr. Batson can be reached through his website or by calling 573-875-7071.